The Chicken Fountain™ will no longer be available as of August 20th 2018. We will continue to offer parts for them right here for the foreseeable future, but these "made -to-order" Chicken Watering Systems will no longer be available here. We are grateful for the many loyal customers who allowed us to grow and evolve our vision, but the manufacturing of them has become too much for our backyard operation. We will continue to offer our innovative "Brooder Bottle Cap™" which will still be available here and at Retail. Our Brooder Bottle Cap™ allows you to turn any standard soda bottle into a safe and healthy source of water for your brooder or isolation cage. No more messy brooder waterers and no chance for an accidental drowning. Q: My fountain was working just fine, but now it is overflowing. What do I do? This could be because something (small debris or water deposit build-up) could be stuck in the valve making it impossible to completely close. The Cleaning instructions and the Reset instructions are listed below. Normally a cleaning will take care of the issue, but if not, you may need to follow with a Reset. Start by emptying out the fountain. Next mix one gallon of hot (not boiling) water with 1/3 cup white vinegar, 1/3 household bleach and 3 drops mild dishwashing soap. Pour this mixture down inside the unit and allow it to soak for roughly 1 hour. After an hour of soaking disconnect the stainless steel hose from the bottom of the unit and take the fountain off of the hangers. In one motion flip the unit upside down "dumping" the water onto the ground, we don't want you to pour it out but more of a dumping action. This dumping action pulls air through the valve at the bottom and will normally dislodge anything that may be stuck. Now fill the unit with clean water and dump it again. You may want to refill it with clean water and dump it out a couple of times to be sure everything is out of the valve. The “dumping” action is quite important. The momentum is what will pull the debris through. Also, filling, dumping, and then filling AGAIN is also important. The valve needs to be filled and dumped to reset, so the next filling will be a better gauge for where the water level will stop. After you clean it, if it isn’t working, you may need to reset it. This is how we test Fountains here before we ship them. It’s a bit tedious, but it may help:). What you would do is to start, turn the white knob clockwise until it stops. Then, turn the knob counter-clockwise 4-6 full rotations. Then, fill the Fountain, DUMP, and then fill again to see where the water level stops. If it’s good, then great! You’re done…. if it’s too high or running over, then empty the Fountain, turn the knob another rotation counter clockwise. Fill, dump, and fill again to check the level. If it’s too low, you turn the knob clockwise, then repeat the procedure. To lower the water level - turn to the left. To raise the water level - turn to the right. (Left - lower and Right - raise). If these processes don’t help, a replacement valve can be purchased on our website. 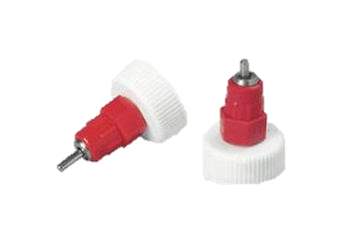 Q: Water does not seem to be coming out of the dripper on my Brooder Bottle Cap™? A: It is very important that you poke a hole in the bottom of the bottle to allow air to enter the bottle as the birds draw water out. Failure to do so will result in an “air lock” where no water will be released from the dripper. To tell if the hole is large enough simple place your finger over the hole, fill the bottle with water, invert the bottle and remove your finger from the hole. If the water comes out of the bottle in one column of water the hole is large enough, if the water “gurgles” as it comes out of the bottle you will want to make the hole a little larger. You may want to do this test in a sink or outside. We’ve finally gone and done it! Yep, we purchased a chicken fountain and installed that bad boy last weekend. OK, maybe that’s a little dramatic. However, let me tell you, this little transformation has just saved me a ton of time and just as many headaches (at least during the non-freezing months). The only thing I don’t understand is why the heck we didn’t invest in the chicken fountain earlier! Now, do tell…how do you water your chickens?